70 Years Ago today, WWII ends in Europe. 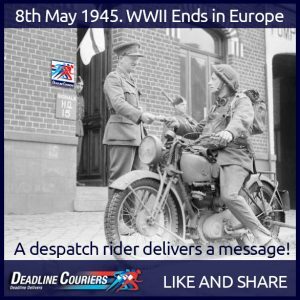 During the war years, a group of corageous individuals roammed the dangerous roads of Europe, the so called Despatch Riders. According to Wikipedia, a despatch rider (or dispatch) is a military messenger, mounted on horse or motorcycle (and occasionally in Egypt during WWI, on camels).